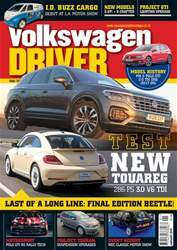 In the July issue of Volkswagen Driver we have news of an international award for the 1.0 TSI engine, a first drive of the new Touareg, and a full 9-page road test of the up! GTI 1.0 TSI (115 PS) 6-speed manual. 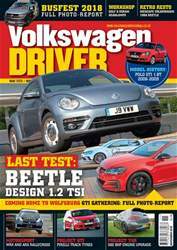 Event photo-reports from the GTI Treffen at Wörthersee, including a close look at the new GTI TCR concept car, the Speedmachine festival at Silverstone and the Classic VW Show at Stanford Hall. 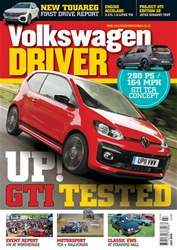 Motorsport reports include I.D. R testing for Pikes Peak, WRX and ARX rallycross from Silverstone and TCR UK Racing at Brands Hatch. Project Mk 4 TDI gets a Koni Active suspension upgrade, Project 7.5R has a Transcal leather retrim and Project GTI has a Jetex exhaust upgrade and dyno test. 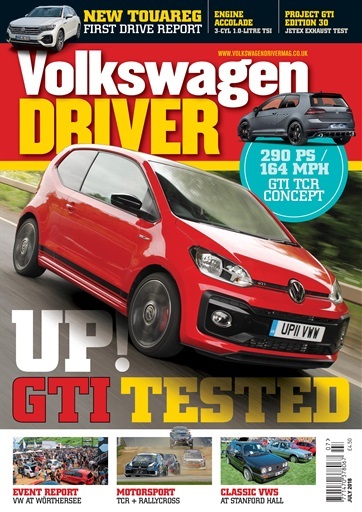 Our products & services pages review a wide range, from the Hankook Kinergy 4S all-seasons tyre to the Carbon Clean DPF cleaner, Liqui Moly Gear Tronic II oil change for auto transmission and you can also WIN a Haynes T5 workshop manual. 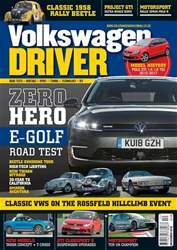 Plus: Subscription offer, specialist trade directory and classified ads for cars and parts for sale.